A world class immersive experience steeped in the Marvel Cinematic Universe, the exhibition integrates science and modern technology with movie based props. Visitors will have the opportunity to explore an extensive range of Avengers operation equipment such as Captain America’s uniform and shield, Iron Man’s MK 45 suit, The Hulkbuster suit and Thor’s mighty hammer. An acronym for Science Training and Tactical Intelligence Operative Network, visitors will able to simulate recruitment as if they were training as agents of the movies’ secret agency, S.H.I.E.L.D. Your mission: To delve into the history, science, engineering, genetics, technology and profiles of Captain America, Hulk, Thor and Iron Man and more. Federation Square’s Chair, Deborah Beale; Walt Disney Company Australia/New Zealand’s Managing Director, Kylie Watson-Wheeler and the Minister for Tourism and Major Events the Hon. 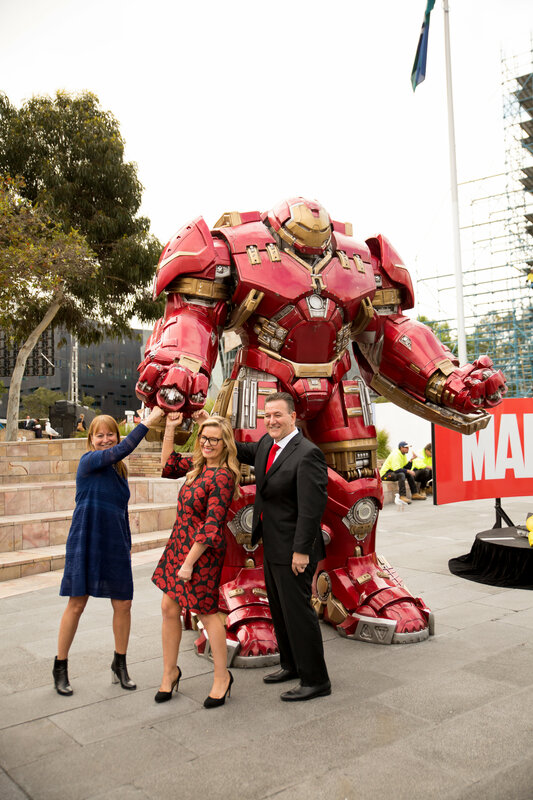 John Eren MP fist pump Marvel Studio’s Hulkbuster at the iconic Federation Square where today they announced the arrival of Australia’s first ever Marvel Avengers S.T.A.T.I.O.N. experience, to open in March 2018. A super-powered dose of science and technology has been provided by NASA to enhance the authenticity of the experience and pique visitors’ interest in real-world science and technology. With comprehensive educational materials available for teachers, plus supporting materials created by the Science Teachers Association of Victoria, this is a thrilling learning experience for high school kids to follow STEM pathways by amplifying the scientific themes and characters that are core to Marvel’s storytelling. The experience has been hugely successful in New York, Seoul, Paris and Las Vegas; where it has since been established as a permanent attraction. In 2017 Marvel broke records in Brisbane with its Creating the Cinematic Universe exhibition that ran for three-months and saw close to 270,000 visitors experience one of the largest displays ever presented. Avengers S.T.A.T.I.O.N. will be a must see attraction on Melbourne’s events calendar with all new features and experiences in its very own purpose built 2,500sqm structure located at The Paddock, Federation Square. Marvel’s Avengers S.T.A.T.I.O.N. opens in March 2018 for a limited time.